This post was written by Mr Ben Hilliam and was originally posted on his blog here. Throughout this year I have been using Microsoft OneNote with my students at St Andrew’s College. Sam McNeill has a fair account of how I have been using it here with my year 9 one to one computing class, and I have been constantly reflecting on how I can continue this journey. Using the SAMR model, I have currently been operating in the Substitution and Augmentation stage, where technology replaces some traditional aspects of teaching, such as “Chalk and Talk”, but with some added advantage. In my case, having examples, notes and work always live and accessible to students through Microsoft OneNote and also recording my lessons as I deliver them and link them back to my class OneNote. This is a very teacher orientated model and I would like to see students more empowered through their use of technology. Here you can see the topic tabs up the top and the lesson pages down the side. You might also notice some tabs to the right of the topic tabs with names on them. These belong to my students. In their OneNote, they can only see their own OneNotes and edit them, whereas I can see them all as tabs and also edit them with the purpose of giving feedback. In this case the student is investigating circle geometry, with a triangle whose hypotenuse is also the diameter of a circle. Incidentally the program used for drawing the circle, triangle and measuring the angles is Geometer’s Sketchpad. While there is nothing revolutionary about the learning happening here, the thing I really like about it is the efficiency. When this task is done without digital technology could easily take up a whole lesson, but this task took no more than 10 minutes. With Geometer’s Sketchpad, the student was able to investigate the properties of the triangle by fixing a triangle’s diameter into a circle, then vary the two shorter sides while measuring all the angles. He was able to quickly copy and paste some questions and a sample of their drawing. This gave the student a framework to explore a rich aspect of geometric reasoning. I like that in this case, time can be given to this rich task, where many mathematics teachers would simply draw the example, say the rule and get the students to copy it down. When I reflect on where this task sits in the SAMR model, I feel that to an extent it is still mostly Augmentation. But there are aspects of modification. 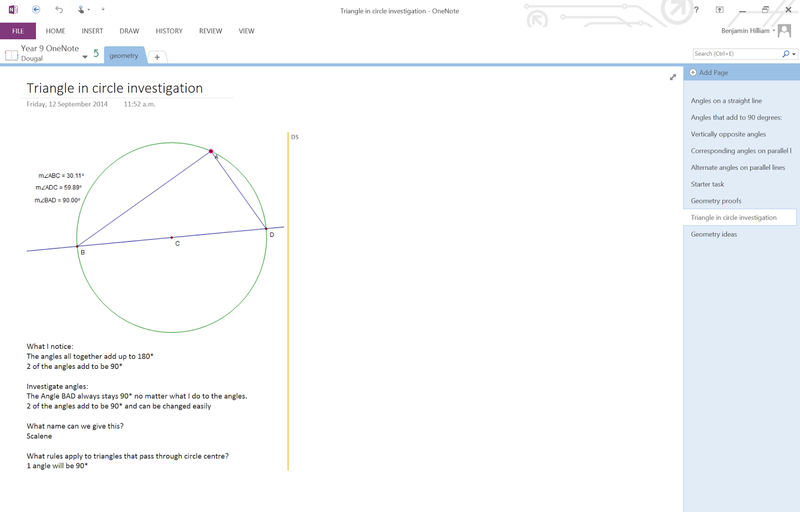 The ability to investigate a geometric rule using Geometer’s Sketchpad has modified the way I teach the topic in so much as it is a much more containable and manageable task within the confines of a 50 minute period. However, the way the student articulates themselves by pasting and commenting in OneNote is augmenting what they would do with pen and paper (and scissors and ruler and compass). It will be interesting to see how my students perform in their next Geometry assessment. But I feel they have had more time to grapple with why these rules work rather than just apply them to a situation. In terms of moving towards Redefinition on the SAMR model in this context, at the moment I am not sure how I would go about that. Perhaps I could get groups of students to explain different Geometric rules then the class can share their results using OneNote. 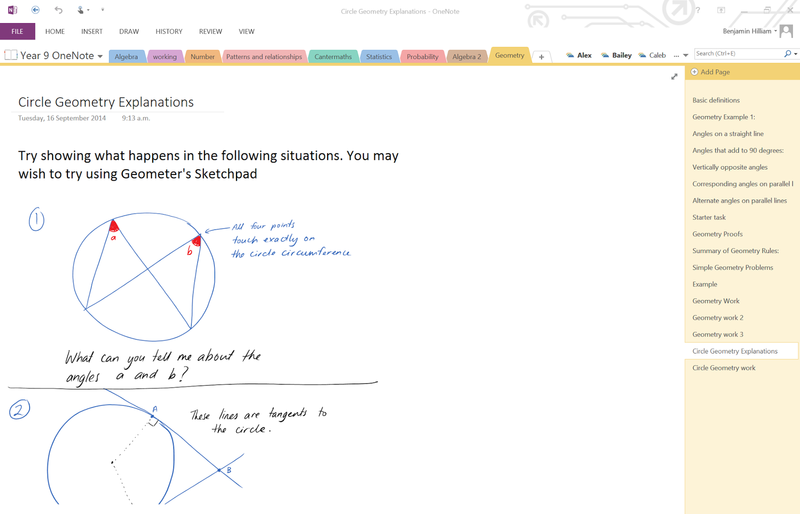 This entry was posted in eLearning, Maths and tagged #edchatnz, #mathschatnz, Augmentation, BYOD, Collaboration, Geometer's Sketchpad, Geometry, Maths, Microsoft OneNote, Office Mix, Office365, Redefinition, Reflection, SAMR, Substitution, Surface Pro 3, YouTube by Sam McNeill. Bookmark the permalink.